creative savv: Yes, I am back!! Spring break turned out to be an exhausting, painful, fun, adventurous, wet, delicious and laughter-filled 10 days! The painful part, (and maybe some of you have experience to share with this), the first day of our trip to San Francisco I did something to my leg/hip/groin. I noticed it in the airport when we deplaned and were walking towards the BART. I thought it was just a cramp that would go away in a few minutes. But it took several days to improve. Whenever I'd sit or lie down for any length of time, the pain would be back when I started walking again. Then the pain would ease with walking. By the end of the trip, the pain was mostly gone. And I thought it was a thing of the past. A few days after returning (a full week after the first inkling of pain), I took a bad step on uneven flooring in an antique shop, and all of the pain returned. Again to dwindle over the course of a few days. Then on Monday, I was squatting in the garden planting lettuce seedlings, and the pain was back. So, I'm trying to be mindful of this pain, and gentle my way through the days. Has this happened to any of you? In googling groin pain/strain, it doesn't look like there's much to do about it, except rest/ice/compression. Advil helps. Onto much better parts of my spring break! Okay, I'll get to the adventurous part. My son and his girlfriend went to Shanghai over spring break. My son's girlfriend is a university student, graduating this spring, so she still lives by the university schedule, meaning her vacation time is limited to breaks between quarters.. She's originally from Shanghai and she wanted my son to meet her family and see where she's from. My son is an adventurer. He is up for all kinds of travel. The two of them flew non-stop, 13 hours to get there. They stayed a little over a week, and flew about 11 hours, non-stop to get back home the morning before Easter. Wow! They had some adventure. Looking through their photos, they saw so many sights in Shanghai. While my son was in China, my two daughters and I had our own adventure. We spent 3 whole days and 2 partial days in San Francisco. 4 nights of hotel stay was all we could afford, so we jammed in as much as we could in the mornings, days and evenings. Even with pain in my hip, we walked all over the city, up and down hills, along the waterfront, in neighborhoods and parks, through a posh district or two, as well as after dark in a rather shady part of town (this is where I grabbed my two daughters's hands, and whispered, "quick let's get out of here", as we practically flew ourselves back to a well-lit, well-traveled street). That evening was the only time I felt even remotely unsafe in the city. 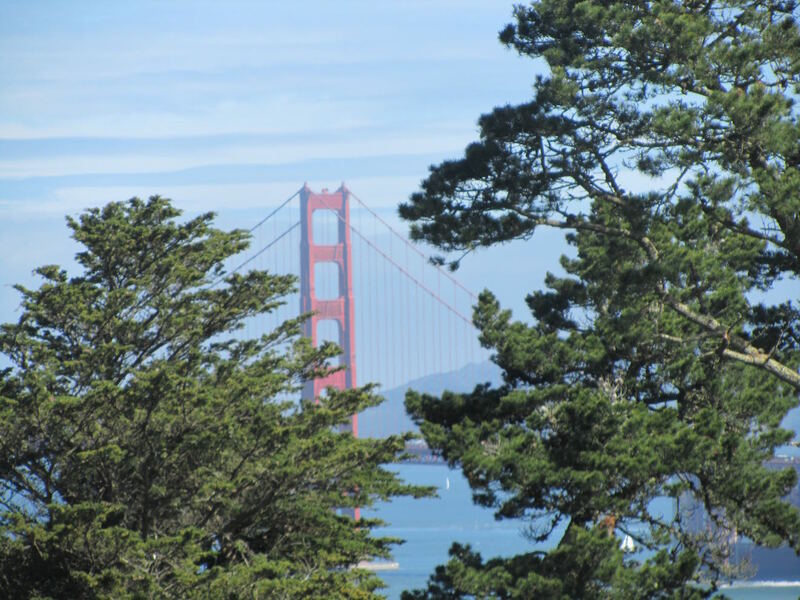 The day that we visited the Legion of Honor, we brought a picnic lunch with us of hard salami and cheese sandwiches, apples and oranges, pretzels, cookies and water. We sat in the park-like setting on a bench, overlooking the entrance to the bay and the Golden Gate Bridge. You can't get much more scenic in SF than that! Our fee to get into the museum was very reasonable, a whopping total of $16 for the 3 of us. We were able to get a $2 discount on each ticket, by showing a transfer from the muni bus we took to get there, stacked with a student rate for 2, by showing student ID for my daughters. The Muni (SF's city bus system) was also reasonable, at $2.25 one-way, per person, for the 30-minute journey out to the museum. Later that evening, after a light dinner, we walked the hills of different neighborhoods out to the top of Lombard Street, then walked down the zig-zagging street to the base. A lot of folks like to drive down Lombard, but I think the best way to see this famous venue is to start at the top and walk down the steps, then at the intersection at the base, look back up to the flower-filled beds which are centered on this street's zigs and zags. The next morning, we walked to Chinatown. There's a fortune cookie factory, where you can watch the ladies folding fortune cookies. It's on one of the alley-streets parallel to Grant Ave (the main drag in Chinatown). I also took my daughters to see how the locals buy super-fresh fish, by scooping live fish out of a tank of water. My son and I had seen that several years back, and it stuck in my mind at how different shopping can be in different cultures. 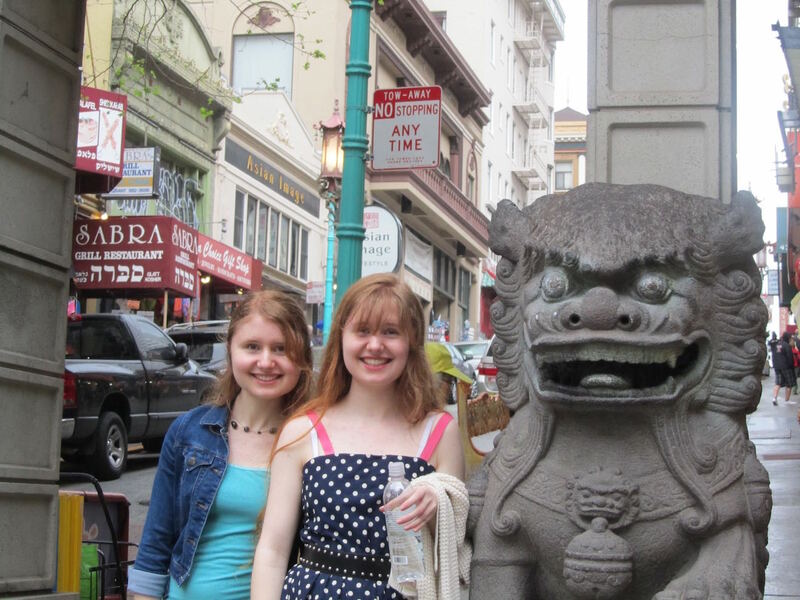 Chinatown was the only place in all of San Francisco that we bought food. We walked into a bakery and bought 3 buns for lunch, for a grand total of $2.80. That's it for our eating out in all of that city. 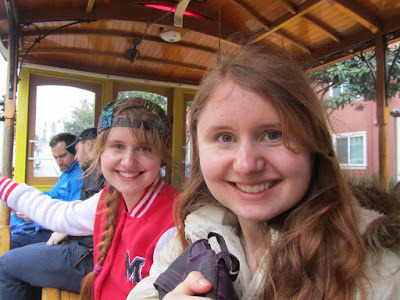 We also rode the cable cars, walked along the waterfront, saw the old ferry terminal and Ghirardelli Square (free chocolate samples in both Ghirardelli shops in GS), went to the theater, climbed Nob Hill, walked to Union Square (another Ghirardelli shop giving out free samples, plus a super large Williams-Sonoma caught me eye). On our last morning, we took a vote on how to spend those last precious hours. taking the Muni out to Alamo Square, the park which overlooks the Painted Ladies (Queen Anne Victorian row houses, seen in the background to the credits of the television series Full House). The three of us enjoy walking, so this was a great way for us to really see the city. The few times we needed to travel a great distance, we took the BART (to/from airport), the Muni (city buses, took 2 round trips) and the cable cars (one-way, inbound, just a few blocks up from the waterfront, no line for the Powell-Mason line, whereas down at the waterfront there was a 30 minute line for the Powell-Hyde line). Muni is very reasonably priced ($2.25 most destinations in the city, in contrast to the cable cars at $7 per person), and well-worth the ride through the various neighborhoods. Our hotel was at the base of Nob Hill, near Union Square. It was a boutique hotel, an old apartment building converted to a small hotel. It wasn't the cheapest place to stay in the city, but it was a far cry from the posh hotels in town.What sold me on this particular hotel were the amenities. Each room had a mini-fridge, stocked with complimentary bottled water and soda pop. The fridge alone was fantastic, for stocking lunch ingredients. But to have the free beverages was a bonus. 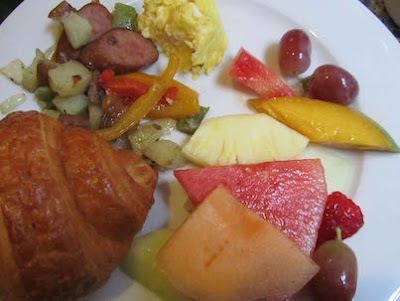 There was a complimentary hot breakfast every morning, fresh apples and oranges in the fruit bowl all day, fresh-baked cookies in the afternoon in the lobby, coffee, tea and cocoa available in the sitting area all day, and an evening reception of wine and appetizers. As my daughters and I are not drinkers, we used the appetizers as our light dinner each night. 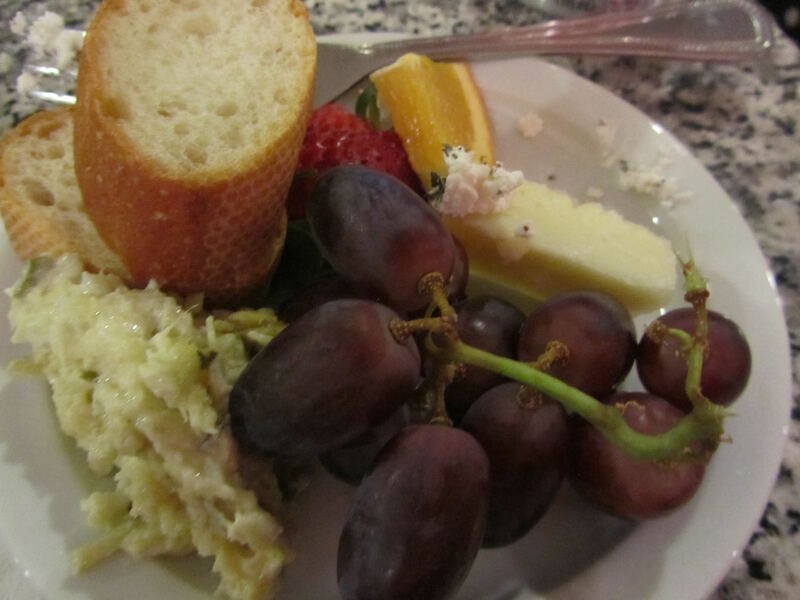 The appetizer selection was quite good each day, with fruit, veggies, dips, spreads, cheese, little quiches, crackers, bread, and always a sweet treat. If we felt hungry later in the evening, we still had a stash of foods in our room, which we had packed with us. The three of us only had 1 backpack each, which we carried onto the plane. Yet, by dividing up all of the food, we were able to carry all of the above with us. We used most of this for our lunches, daily, as well as snacks whenever hungry. As I mentioned before, by bringing some of our food with us, and by taking full advantage of the offerings at our hotel, we kept our eating out spending to $2.80, for 3 people for almost 5 days. We had an awesome all-girls trip, with much giggling, fun window shopping, lots of sight-seeing, and more walking than I do in a month at home. Sounds like a wonderful trip. Ward and Wally have been to San Fransico, but I haven't. Maybe some day. Traveling with petite girls is different than travelling with big boys/men. There is no way in the world, the males in my family would have been satisfied with the light suppers you had although I would have. Do your son and husband have large appetites? Sorry to hear about your pain. I have a lot of aches and pains, but I haven't had that particular one. If it doesn't clear up soon, a visit to the doctor and physical therapy might be in order. I second the doctor/PT recommendation--but you knew I would, didn't you? I wonder if you have bursitis--I have occasionall problems with it in my hip. Here's a link (cuz that's what I do ... give people links! ): http://www.webmd.com/pain-management/arthritis-bursitis . A good outpatient PT who works with orthopedic injuries will be better at diagnosing and treating than a family physician, for whatever that's worth. Such a fun trip! Your girls look older--I don't remember any recent pictures of them. You will have great memories of this forever. And how neat for your son to go to China! Thanks for letting us be armchair travelers with you. Oh, I think you would love to see San Francisco! There are only a handful of cities on the west coast that I think are must-see cities, and SF is one of them. When my son and I were here, we concentrated on historical sights (maritime museums, the mission), as that is what interested him most at the time. 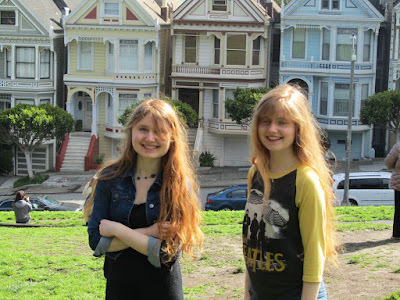 With the girls, they were interested in architecture, art, theater, more, and less in historical things. So much to choose from, in what to see. We decided that if we return, we will stay in a completely different part of the city, so we can get a feel for another area. I hope someday you can come out this far west and see SF, and maybe even Seattle! Yeah, I'm not sure if the appetizers would have been enough for dinner for my husband and son. We'd have had to supplement with things like Cup of Noodles from the room. Or, eat the appetizers offered, then go out for a snack later. But they definitely would have gotten enough for breakfast -- the offerings at breakfast were very substantial. So, even for us girls, it worked like this, fill up at breakfast, picnic lunch, snacks from what we packed and the fruit and cookies at the hotel, then light dinner. You can eat out cheaply in SF, by eating in Chinatown or at the various taquerias (my son and I found a taqueria with enormous burritos, Chipotle-style, plus chips, for $5 per person). Whole fruit was cheap in Chinatown, too. If we hadn't had fresh fruit available to us for free, I would have picked up apples, oranges and bananas in Chinatown. Thanks for that link. Bursitis could be what it is. And thanks for the tip on getting input from a PT, as opposed to the family practice dr. I'm going to give it through the weekend. We did have such a great time, the three of us! And while there would have been much more to see, we had exhausted ourselves on sight-seeing by the end of our short trip. Just means, we'll have to go back someday! I loved looking at my son's trip photos. Shanghai is a beautiful city, with so much to see. I know he'll be wanting to go back there. Glad to see you back and that you had a good time! Hubby had his hip replacement yesterday so we're dealing with pain, nausea, hospital stay and getting the home ready for him. Very busy but I just made a dinner for anyone who is coming and going today. Chicken and rice casserole that is cooling now and then in the fridge for whomever, whenever. Laundry is done and all the floors are mopped getting ready for hubby's homecoming. I have to remove all the rugs and get the raised toilet seat up but that can all be done in a flash when I know he's coming home. I wish your husband a very speedy recovery from his surgery. It is so amazing at how quickly they get you back on your feet after hip replacement. My mom had hip replacement and they had her upright the next day. Will your husband have PT daily, once home? My FIL is going in for knee replacement next month, and he'll be staying in a nursing home for a couple of weeks, so he can get PT daily. Otherwise, if he went straight home from hospital, he'd only get PT 3 times per week. I wish your hubby well! Will be praying for him (and you, too, to keep up with the extra demands of a "patient" at home). Your trip sounds like it was so much fun! Great memories for you and your daughters. I loved reading about what you saw and your frugal tips. Thank you! Once the lodgings are paid for, SF can be done cheaply. The city makes public transportation and sight-seeing/museums very affordable for the locals. No need to ever take taxis, museum tickets can be so cheap. We could have paid even less on our museum tix, if I had known to print out a coupon to save another 10%. And there are parks all over the city to take picnic lunches to. 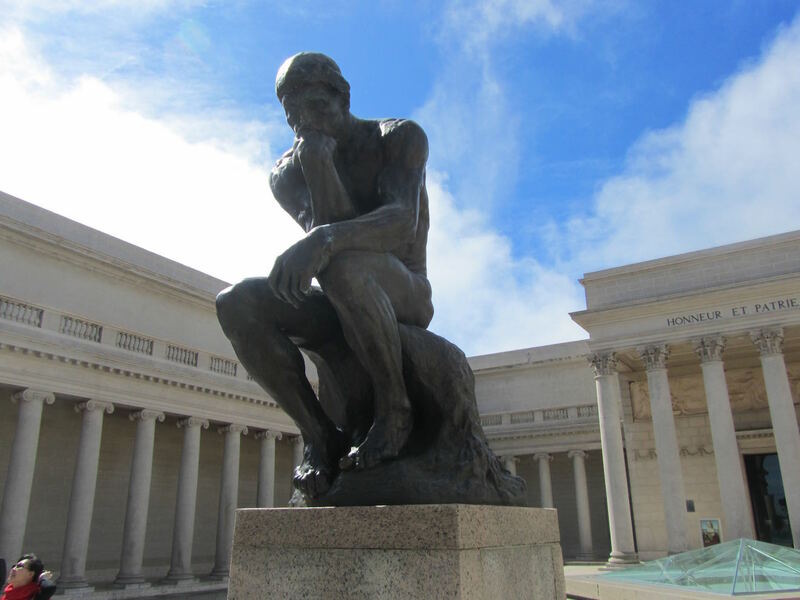 As far as BART ( for to/from the airport), buses (for getting around the city), museum tickets and parks available, SF is more affordable than Seattle. Thanks for reading, Teresa. I hope you had a great Easter! your blog today was well worth the wait! Kudos for the fabulously frugal vacation you had with your daughters. It was great to read about the many ways that you saved money and made the best of the freebies. Wow, $2.80 out of pocket for food is amazing! Thank you! I am rather proud of that $2.80 for all food for 3! Not to pat myself on the back too much, or anything! The food savings really offset extra that we paid in a hotel. I imagine 3 people could easily spend $100-$120 per day for 3, if they had to eat out breakfast/lunch/dinner, and that would be doing those meals cheaply. We really had great weather there, too. Only one day of rain, and it didn't rain for the whole day like it can here. So, we could continue with our sight-seeing even with rain. I've had a very similar sounding pain in my hip sockets. I got it by slipping off balance after squatting for an extended period. It was so painful, constant pain, and I was bedridden for a few days. I have a debilitating back issue that is being addressed with physical therapy, but the pain from the slipping while squatting was so much worse. "RICE" helped a lot, but if I recall correctly ibuprofen didn't, not even aspirin. Nagging constant pain that is there every minute, not the gentle throbbing, is not fun. Eventually it went away, and today I'm not bothered with that pain at all. Hopefully your pain will disappear after some rest too. I've even strained my neck in a bad way, and that pain still comes and goes the minute I reinjure it. Soft tissue injury can take a long time to heal, sometimes longer than a broken bone, according to my nurse cousin. After three months of lingering neck pain, I finally went to the doctor and took an xray, since my injury happened when a 2x4 lumber fell smack on my head. No broken neck bones, but the pain is still there almost a year later. Some of the exercises from physical therapy to strengthen the neck area seemed to reinjure it, so I stopped the PT. It is getting better slowly but surely, so I will not bother to go back. The therapist said the pain can get much worse, yikes, but thankfully it has not. Your daughters look so very happy... must have all had a wonderful time together!! We like motels that serve a full complimentary breakfast too, really helps us save time...and money. Your hip pain sounds pretty bad, worse than mine for sure. I am glad that it eventually went away for you. Advil is helping me, fortunately. I just can't take it on an empty stomach, so in the morning, I have to wait until I eat something (I don't eat right away in the mornings). What I really dislike is how he pain slows me down. I feel like I can't get as much done in a day. Argh! I hope your neck pain continues to diminish! We did have a great time! I can't imagine not staying someplace with a complimentary breakfast. Not just the money-savings, but I didn't have to cook/wash dishes. That, for me, is a vacation! Glad you are back, and had a wonderful trip with your girls! It sounds like so much fun. Your hotel had wonderful amenities. The appetizers and fruit in the evening would be especially nice! I would have been completely satisfied with that, although my husband and sons most likely would not have been satisfied. I went on a work related trip with my husband two weeks ago, to Berlin (Holmes County), Ohio. The hotel his employer chose for us was wonderful. There was a complementary hot breakfast every morning with lots of choices. My husband loved the waffle maker! There was always coffee/tea/cocoa in the lobby, along with lemon/lime infused water, a bowl of apples/oranges/bananas, and cookies. We filled up on the breakfast each morning, spent time sightseeing and perusing the Amish shops and antique malls, then had a late lunch/early supper in a restaurant. The Amish food was delicious...especially the pies. We had brought bottled water and a few snacks for late evenings in the hotel room. I enjoyed the trip, just wish the weather had been a little nicer. The first day it was sunny and in the mid 60's, but it was cloudy, and windy with highs in the upper 40's the other two days. Such is March in Ohio. Lol. I can't think of what would cause the hip pain, but I hope it's gone soon. If it's not, I agree about checking with a doctor. When I first started to read your comment, I saw "Berlin", and not knowing there's another Berlin in this world, I thought, "wow, what an amazing work trip!". But Amish country sounds so very interesting, too! See Amish areas in Pennsylvania was a highlight of a trip I took when I was a teenager. I can imagine the pies, too. Thanks for the well wishes. One way or another, the pain will eventually be gone! Kris, I agree the countryside is beautiful! Our hotel room had a balcony. The fist day we were there (when the weather was nice), we sat on our balcony and we could see a lot of that countryside...the farms dotting the hills. I loved hearing the clip-clop of the Amish buggies. Our favorite restaurant there was Boyd & Wurthmann. My husband loved the open faced roast beef. They have almost 20 varieties of pie each day. I had cherry with a scoop of ice cream. The pie crust was so good! It was such a cozy little restaurant too. We'll be traveling to Berlin about three times a year for my husband's new employer. I can't wait to go back! Lili, yes that would have been an amazing trip. So far, I've not been an international traveler. Unless you count maybe being in Canadian waters while on Lake Erie. Lol. My husband found out on February 1st, that he was losing his job. His company was sold last fall, and his location closed in March. During the job hunting process, he applied to a company whose parent company is located in Germany. All employees (and spouses) are sent on a week long trip to Germany each year. I was excited and nervous at the prospect of this. Since I've now been to the Amish country in Ohio, I've been wondering if the Amish country in Pennsylvania is any different. Hopefully, I'll have the opportunity to check it out sometime. Angie, If you ever do get to Amish country in Penn, please let me know how it's different/same from Ohio, as I've never been to Ohio, at all! One of these years, I'd like to see that part of the country, Ohio, Michigan, Wisconsin, Indiana, Illinois -- all of that, I've never, ever seen! There was a TV movie a long time ago, The Awakening Land, set in the Ohio river valley that really got me wanting to see that part of the US. Someday! I'm so glad for you that your husband was able to land another job so quickly. And the perks so far (trip to Ohio Amish country) sound pretty good. Sometimes these changes offer things/opportunities we never imagined. Welcome back! It sound like you & the girls had an amazing time! I really enjoyed hearing about the trip. Great job on spending hardly anything on food while there, it saves so much money when the hotel has breakfast & you are able to bring some things of your own. Sorry to hear about the pain you have been having. Thank you! I agree, the food part of traveling can be as expensive as the lodgings. My pain will get better, I'm sure. Thank you for your well wishes! So glad you had such a wonderful trip SF is truly an amazing place I lived there briefly in the 1970s. I have had an issue with my hip also My Dr. did MRI an X-ray and found nothing ! I believe it was bursitis. We were taking care of our two grandsons ages 2 and 3 after they went home it gradually cleared up. But for about 4 months it was not fun. I have to comment about your daughters. They are just beautiful what lovely hair and eyes and nice smiles too ! Hope you are feeling better and glad you had a nice trip . thank you! We did have such a great time. There was so much to choose from to see. I think it could take several trips to see it all in SF. How nice for you that you lived there in the 70s! Hmm, bursitis. Interesting. I read the link that Kris left in her comment, and bursitis does sound like a possibility for me. I'm gad to hear for you and me, too, that your's did indeed clear up with some time. I don't want to feel not right for 4 months, though! That must have miserable for you! I'm so sorry! My daughters are such a blessing to me. (So's my son -- he's an amazing young man, too). I do wish I had their hair! Oh, it sounds like a wonderful trip, Lili. I'm so glad you had such a good time. I also hope your hip doesn't give you any more problems. Glad you were able to make it around SF without it bothering you too much. thank you! For the amount of walking we did, it is amazing that my hip didn't bother me more. But that seemed to be the key for me, to just keep moving. How was you daughter's spring break trip? Did that happen already? Or is it still to come? Off topic...but noticed how much prices have gone up at Amazon for the Knox gelatin 1 lb. cannisters: 2 pack is now almost $30....back in September, Lili, you mentioned in a post that you bought yours for $10.13 each, sold in 2 packs....OMG. Do we have food price inflation, or is it just Amazon raising prices? Shucks, I wanted to place an order today, but don't know if I want to pay that much for gelatin. I bought Now Foods Beef Gelatin Natural Powder 1 lb (Pack of 2) for about $24. Lots of health benefits. Thanks for the tip about ordering from Amazon! YHF, I have no idea how Amazon sets prices. Sometimes the prices seem ridiculously high. Were you able to get free shipping? I noticed their free shipping offer now has a higher purchase amount. Bummer! I'm glad you found some gelatin at a good price. Now Foods is the brand of some supplements I take. I wonder if this gelatin is also known for it's health benefits? We're just heading into that time of year when I make a lot of fruit jello. So, I'm glad I stocked up on it. You'll see in tomorrow's blog post that you're not the only one concerned about food inflation. I had some moments earlier this month when I was shocked about some higher prices. Just trying to roll with it and find more alternative sources for some of my items. Yes, I was able to order over $49 since I had an Amazon list of items to order: Brother compatible printer toner for a fraction of Office Depot prices, and two add on items. I wanted to order some sprout seeds too, but I will wait for the next time to order. Earlier this week, on Hip2Save coupon blog, there was a $10 promotional credit offered on a $50 Amazon gift card purchase. I ordered an egift card and was able to use both the promotional credit and the egift card for this order, so I saved there too. I was impressed with the nearly 5 star rating on this brand of gelatin. Some reviewers thought it helped with their joints, skin wrinkles, hair, nails, and IBS/constipation issures. I don't know if I would waste gelatin in coffee just to consume it daily (as many wrote in their reviews). I will probably make fruit jello too and have dessert more often. Locally, prices are creeping up, so I agree, it looks very much like we have food inflation. Can't wait to hear what you will say tomorrow. I do the same thing, keep a tally of everything I need to order, so I'm not making multiple small orders, and can take advantage of free shipping. It really saves a lot, and for you, especially there where you live. Sounds like you had a fabulous trip... well excluding the pain part! And your photo of the Golden Gate Bridge is AMAZING! It looks like a postcard! 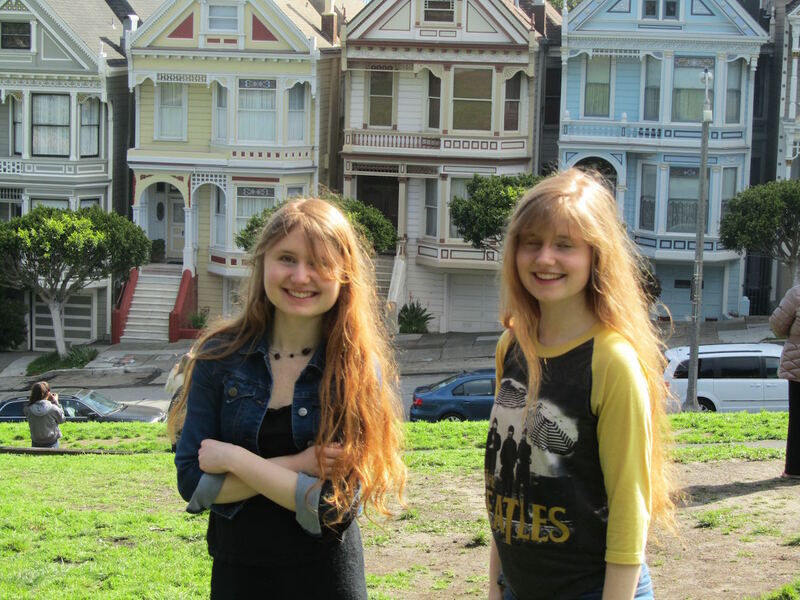 And I LOVE the one of your girls in front of the painted ladies... with the sunlight catching their hair. So anyhow, in terms of hip pain... I've suffered off and on for the better part of the last 10 years or so. I'm not sure what caused mine - possibly some old injury or something, though it wasn't the sort of thing that came on suddenly. I mostly notice problems when I'm sleeping or sitting and it's more of a dull ache than a sharp pain. I think there are about a zillion different things that can go wrong in that area - and hip pain can also be referred pain caused by a lower back problem. So the chances that we're suffering from the same thing are probably slim, but just in case this might be helpful, here are a few things that are working for me. The first is that I'm training myself out of crossing my legs. Apparently crossing your legs puts uneven stress on your lower back and hip muscles and can lead to problems over time. For the past 3-4 months I've been making a concerted effort to ditch that lifelong habit, and it does seem to be helping. The other thing that really helps is a somewhat counter-intuitive stretch. I'm not sure how to describe it, but in yoga they call it "child's pose." Basically you curl up in a fetal position with your knees as close to your chest/shoulders as you can get them, knees, feet and head (face down) on the floor (not as complicated as I'm making it sound - Google it to see pictures.) Apparently there are all sorts of small muscles, tendons and ligaments going every which way connecting the hip & pelvis area, and for some reason that I can't quite visualize, that position causes an intense stretch across the front of my hip area and really relieves the pain. Don't know if either of those things would help you or not, but they seem to be working for me. Anyhow, I hope that whatever's going on clears up soon because trust me... I know how un-fun it is to deal with! very astute of you to notice. They are mirror image identical twins! Not many people know that exists. There are a few other small details about their appearance that are mirrors of each other. I'm constantly finding new little details. The hair part, though, is just what they like on themselves, not a natural part, I believe. The funny thing is not everything is opposite. They're both right-handed, for example. Thanks for your info on hip stuff. I've been thinking yoga might really be beneficial for me, especially now with getting older. Sounds like a wonderful time, done very reasonably financially! Lots of wonderful memories for you all...hope the hip issue is completely resolved quickly! Thank you, Cat! I hope my hip is completely better soon, too. I don't like to be slowed down. Slow is not a speed I understand. I either stop completely, or I go full-speed. We had such a good time. And although lodging is expensive in SF, transportation and seeing the sights in the city is very reasonable, and food can be, too. all the time. I use a foam roller, base ball,soft ball, golf ball and a roller. also have a Thera Cane, I had a really great body work guy that taught these principals. You can find most of them on You Tube and Google. I agree with Cat it could be referred pain. Listen to your body. :). I hope this makes sense. I've been thinking of you. Have you heard anything yet on your tests/biopsies? Praying for you right now. Thank you for the information. I'll check that out. Thank you for this Patti. I googled and found a drawing of exactly where my pain is. I tried the roller, using a long narrow pillow. I'll try it again tomorrow, and see if I feel any relief. There was also a link to pain and dehydration. Made sense to me. I'm going to try and drink more water, less coffee/tea for the next several days. I would also search Myofascial release hip flexors. Thank you for praying. have not heard anything yet. They said it could take up to 4 weeks. Have a wonderful weekend.